The council-owned land was occupied in August by around 40 people who had been evicted from Hotspur Press — itself an embarrassing episode for Mayor Burnham which prompted protests outside his office only weeks after his election on a ticket of helping rough sleepers. The county court bailiffs turned up to evict the residents, they spent over an hour watching and waiting, then called on Greater Manchester Police. 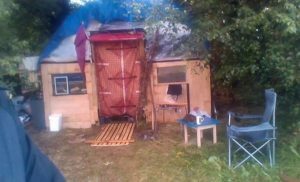 The number of people who came to support the attempt of eviction on the Addy meant that when they made contact this morning, with people up in the tree houses, the tunnels that were built and the solid line of Activists, the bailiffs were made to change their plans as they were facing resistance. The group made it clear that they would not be moved today, and that we were prepared to go to high court to seek a further ruling. This was another victory against the council, their eviction policy and drive to gentrify Hulme. This would have not been made possible without the support from the Hulme community and the Manchester squat scene. Thanks to Lousy Badger Media for being there to livestream, Manchester Activist Network for their solidarity and our Liverpudlian family. Addy residents have spent the last two months at the site building small liveable spaces and planting seeds in an effort to make the space a community environment again, and have plans to transform the hitherto closed playground into a permaculture sanctuary. They’ve also stressed that they’re well provided to resist an eviction, but would welcome people coming down to support.